The image Hare took as an artefact of citizen/tourist journalism is neither a photograph taken by one Ed Jones nor potential proof of a 4-metre crocodile freely roaming the backwaters of Dubai. In reality, the image is a copy of a relatively famous photomontage created by Richard Allenby-Pratt, a British photographer and artist, and former resident of Dubai, as part of his iconic series of pictures of what post-apocalyptic Dubai might look like. My question is: who is Ed Jones? Just a local prankster? Allenby-Pratt or someone close to him, perhaps? Someone who has beef with 7Days, in general, or Hare, in specific? I suspect it will all come out soon. 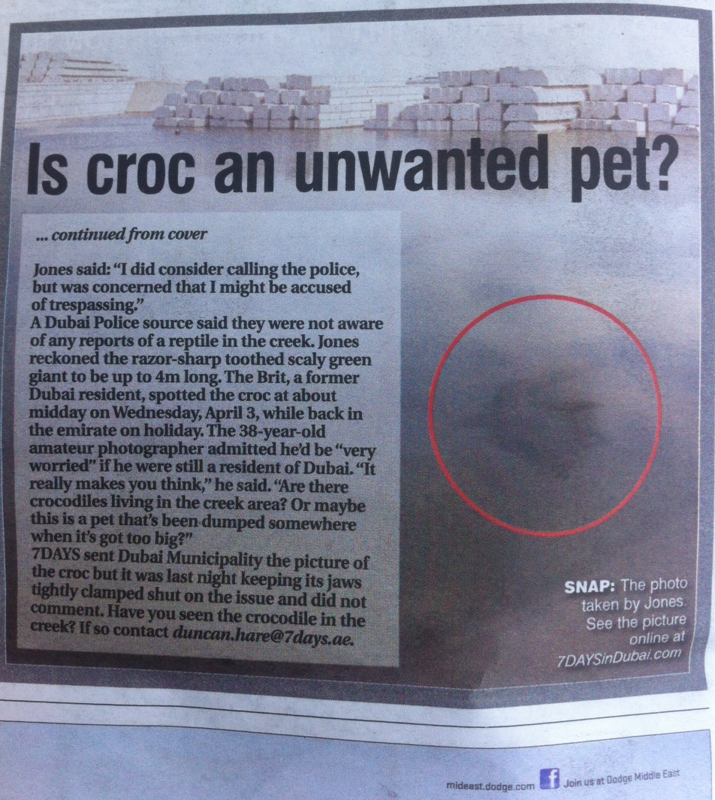 Whoever it is, he/she succeeded in getting this little canard on the front page, which tells us two things: one, journalistic practices in certain UAE newsrooms are not as robust as they should be (if you type the search terms "crocodile" and "Dubai" into Google Images, Allenby-Pratt's image comes up pretty quickly); two, the prank has probably gone further than even the people behind it could have wished for. Do you know Ed Jones or anyone who might be involved in the hoax? I don't know an Ed Jones, but I do have suspicions about one or two friends back home. How did you find out about the story? I found out when a friend texted me at about 7am this morning. I went online, saw the story and thought it was funny. Are you going to charge 7Days for printing your artwork? Looks like 7 Days have been a bit naive, but I'm not going to make trouble, I'm sure the publicity won't do me any harm, although I need to make it clear that this publication had nothing to do with me. The Abandoned series caused a quite stir when it was first shown in Dubai. I imagine you also witnessed some strong reactions. Overall, what has been your experience with the project? I have had zero bad reaction from it's publicity in Dubai. People here are much more open-minded than is generally thought, and can recognise that my project is concerned with global issues, not about criticising Dubai. The project is currently exhibited at Shelter in Al Serkal Avenue and the reaction and feedback has been fantastic. The complete Abandoned series by Richard Allenby-Pratt is on show at Shelter until April 17, 2013.